The first official photo from The Walking Dead Season Nine's back half shows a dead character being brought back to the Hilltop for a proper burial. Spoilers for The Walking Dead Season Nine follow! Major spoilers. In The Walking Dead's Mid-Season Nine finale, Paul "Jesus" Rovia had a terrifying sendoff as a Whisperer revealed himself and stabbed the Hilltop's leader straight through the heart. It won't be the last episode of Tom Payne on The Walking Dead but it was certainly the end of the road in the present timeline for his Jesus character. 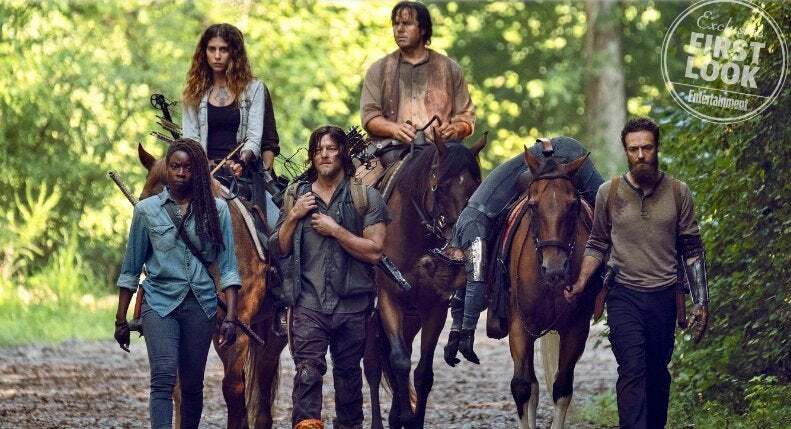 Check out the photo of Aaron, Michonne, Eugene, Daryl and others carting Jesus' lifeless body back to the Hilltop below. "We had a little send off dinner like we usually do at a restaurant in Atlanta," Jesus actor Payne told ComicBook.com. "But the thing about it was, it was really odd, that sequence, I went back and shot that, we did two days of re-shoots on that, spread apart, as well, to add in different reaction shots and stuff. So I had my kind of like, 'Yay, and that's a wrap for Tom Payne,' and then, it wasn't because I just kept coming back to shoot that sequence." The sequence in which Jesus perished was directed by Michael Satrazemis on stage to preserve the foggy aspect, providing a true horror genre feel for Jesus' sendoff. "The last time I went back, I was literally just lying in a pool of blood while [Aaron actor Ross Marquand] cried over me," Payne explained. "So I had an ending, but it wasn't really the ending. You know, it's not the ending until they finish shooting really because you can always do re-shoots and stuff. So yeah, I had an ending but it was pretty drawn out."